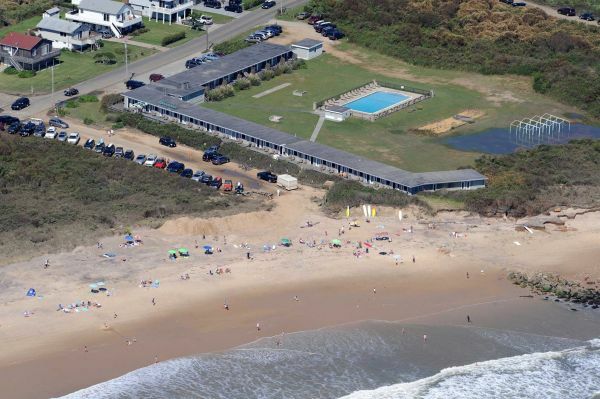 Nearly a year and a half after being bought for less than $15 million, the East Deck Motel in Montauk, adjacent to some of the most coveted surfing territory on the East Coast, is back on the market for $25 million. ED40, a limited liability company, bought the 10,500-square-foot, 30-room motel in October 2013 with plans to turn the more than 60-year-old establishment into a private beach club. After facing opposition from local residents over plans for the Ditch Plains Beach staple, the owners now want to sell the building and its 5-acre parcel. Rylan Jacka and Edward Bruehl, associate brokers at Sotheby’s International Realty, are listing the property. Since coming on the market on March 22, the motel has generated a large volume of inquiries from potential buyers from as far away as Europe, they said. The former owner, Alice Houseknecht, originally put the property on the market in 2010. Newsday reported an asking price of $20 million. In 2013, she sold the motel for $14.75 million. While no substantial improvements have been made aside from restoring sand dunes, Jacka said that rising market conditions and the rarity of “commercial property on the ocean” in Montauk warrant a higher price tag. The property’s current owners intended to upgrade and expand the facility and turn it into a private beach club, Jacka said. Those plans were withdrawn from the Town of East Hampton’s Planning Board after community opposition. Some residents feared that development would limit open access to the prime surfing hot spot. ED40 offered to sell the motel to East Hampton Town following the withdrawal of its application, but the company turned down the town’s $8 million offer earlier this year. “The owners felt that the $8 million bid was far too low to sell to the town, so they’ve chosen to put it on the market,” he said. An attorney listed for the property owners declined to comment. While Bruehl wouldn’t speculate about what a buyer might do with the property, he said some inquirers have expressed interest in simply upgrading the aging motel. Given its proximity to the ocean, “if you were to just go in there and renovate what was, you’d have a pretty remarkable property,” he said. The East Deck is zoned as a resort property, a town designation that allows for hotels, restaurants, retail stores, bars, private clubs and even nightclubs with approval from the Planning Board, said Jonathan Tarbet, real estate attorney at Tarbet & Lester PLLC in Amagansett, and a former attorney for the town’s zoning board. While a buyer could make additions to the property, current town setbacks — regulated distances properties must keep from tidal wetlands — would limit development closer to the water.